For many years, European explorers sought the source of the big Muddy – the Mississippi River. And though the Native Americans of the region found the white man’s quest a constant source of amusement, he spent many decades arguing about, and attempting to claim, the birth site. 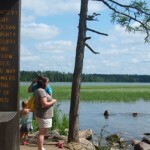 Today, of course, we know the source to be Lake Itasca in northern Minnesota. But it’s still quite amazing that from the northern tip of this tiny lake one of the most powerful rivers in the world begins its 2,340 mile journey to the Gulf of Mexico. The park is often jam-packed with kids as it was when we arrived this afternoon. 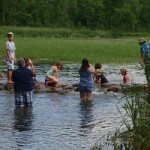 But to my surprise, the kids splashing about and their lack of understanding of the importance of this tiny trickling creek, didn’t take away from the spiritual experience I had dipping my feet in the cool waters. As I waded from one shore to the other, and watched the toddlers swim in the clear, knee high water and their chasing parents crack their shins on the too-slippery rocks, I imagined that this water, the water caressing my ankles would soon be visiting other destinies. A drop of rain falling into Lake Itasca this morning has many adventures ahead of it. In the three months it will take it to reach the Gulf, maybe it would splash alongside a barge carrying its coal to heat homes in Memphis. Maybe it would settle in a dry watershed to help prepare next year’s crops. What if it was a small piece of a life-changing levee breech before it poured back on course? From this spot, weeks and months from now lives would be changed by these fledgling drops, and my feet were lapped by many of them. They say if you make a wish it will come true before the water reaches the gulf. I’m already living my dream, I’ll give my wish over to one of you.